There was a good post with ten budget-friendly date night ideas over on To Love, Honor, and Vacuum recently, suggesting things like go out for dessert or coffee and other such things that I won’t spoil here (go over there and read it and I get nothing for suggesting it). Those ideas seem good if you are either an extrovert or live in town. I, on the other hand, live way out in the country and am in introvert and although Michael is an extrovert, after driving into town for work, he does not want to go back out once he gets home. We are both content to just be at home. It truly is how we spent the majority of our dating life as well: just hanging out together at someone’s house be it his sister’s, my parents’, the place he lived with others, or even others’ homes. So it is no wonder that our married life has looked so similar. However, it is important to connect each day! Talk to each other. Eat together. Take a walk together. Share experiences together. Marriage is about living life together not living your separate lives but in the same house with benefits. I have come to realize that we are not normal in our home. 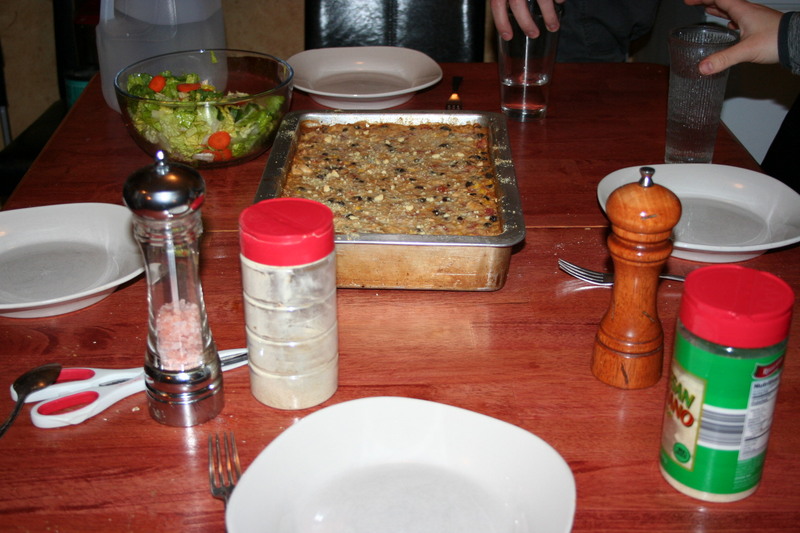 We eat the vast majority of our dinners together, at the kitchen table (we do not have a dining room). We don’t usually have anything on the television either, unless it is just music or for noise. (Michael hates to hear people chewing their food. ) We talk at dinner. We fellowship together. Then the rest of the evening, on many occasions, we will put on some videos (tv show–Stargate is a frequent one) we own. We are each doing our own thing but all still kind of paying attention to the show; we interact with each other but are all still doing our own thing but we are doing it together in one room. Yeah, it’s been challenging at times, as they people that the guys play with online can hear it too, but enjoyable all the same. I guess what I’m saying is that date night is a great idea but I think the point of date night is to interact with each other. So, although Michael and I don’t really have many date nights, we interact with each other on a daily basis, outside of the to-do lists and frustrations of the day. One thing I’m hoping to do when it warms up a bit, next month probably, is get him to go on a short walk with me in the afternoon/evenings. I need the exercise, so he’ll probably agree to it, to encourage that. Well, I hope you will consider how you are living life with your spouse. Don’t just put it off for one night a week. Engage with each other, each day. And as special days approach, add an extra little touch to make it a bit more special. Marriage takes work to have what you thought it was going to be.